Brontë Country – if you’ve ever read a novel by one of the Brontë sisters then a visit to Haworth visitbrontecountry.com is an absolute must. Take the train from Ilkley (via Shipley) and then the Keighley & Worth Valley Railway by steam train – kwvr.co.uk used for the film ‘The Railway Children’. Avoid Haworth at all costs on Bank Holidays, unless you love crowds! 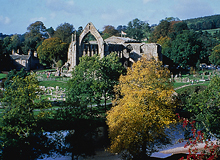 Bolton Abbey boltonabbey.com – strictly, Bolton Priory is the correct name for the ruins, although the popular name encompasses the delightful village with tea rooms, riverside walks and gift shops. The Strid, where the waters gush through a narrow wooded gorge is worth the stroll after a cream tea – just don’t be tempted to jump across to the other side! Another steam railway – the Embsay and Bolton Abbey embsayboltonabbeyrailway.org.uk – is nearby as is Buffers Tea Rooms – a must for model railway enthusiasts of all ages in the hamlet of Storiths. Expect to buy at least one model engine if you’ve got young children! Harewood House harewood.org – huge and spectacular, East Riddlesden Hall nationaltrust.org.uk – friendly and the staff dress up in period costume, Ripley Castle ripleycastle.co.uk – rather more commercial, but well worth the journey, are just three of the great houses to visit in the area. Whilst near Ripon visit the awesome yet exquisite ruins of Fountains Abbey fountainsabbey.org.uk Harlow Carr Gardens – rhs.org.uk now owned by The Royal Horticultural Society – excellent at any time of year. Like most, there’s a tea room, restaurant, gift shop and plant centre. Skipton – if you want to savour a proper English market day, then Skipton skiptononline.co.uk is a must on any Monday, Wednesday, Friday or Saturday. Be warned that you’re likely to return with bagfuls of local Yorkshire cheeses (Wensleydale with Apricots is our favourite! ), freshly baked pork pies and other goodies! Visit the Castle whilst there skiptoncastle.co.uk and the Leeds and Liverpool Canal.